For a band that only released one EP, one CD Single and one full-length Album in a relatively short-lived career, Nymphet Noodlers and their band members, vocalist Mattias Hellberg, guitarist Mattias Bärjed, keyboard player Martin Hederos, bassist Jan Martens and drummer Jesper Karlsson certainly had a lasting impact on the Swedish music scene. The Hellacopters, Nicolai Dunger, A Camp, The Solution, Stefan Sundström, Dundertåget, Henrik Berggren, Magnus Carlson, Diamond Dogs, Refused, Tonbruket, Sofia Karlsson, Anna Ternheim, Nationalteatern, Håkan Hellström…the list of bands, artists and projects that each has been involved with in some way or another over the years would be longer than a telephone directory! However, there was one band in particular that might not have existed without them, a certain Soundtrack of Our Lives. So, just who were Nymphet Noodlers? 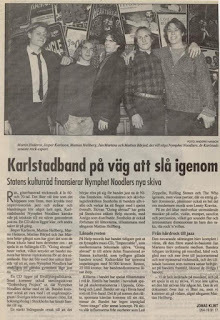 Formed in the early 90’s in the city of Karlstad, a few hours to the North East of Gothenburg, Nymphet Noodlers evolved from the ashes of local bands Ugly Jake and Christ Couldn’t Come. 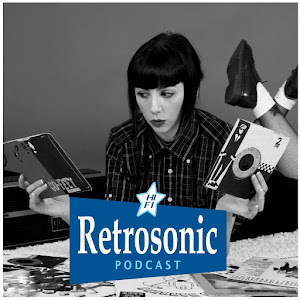 Front man Mattias Hellberg gave me the low down on their early history in our Retrosonic Podcast interview back in 2012. 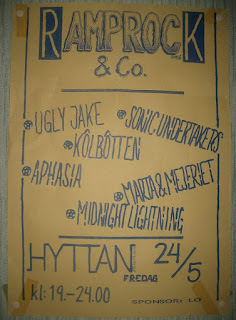 “I had a band called Ugly Jake at the time and a week before we were due to play our first gig in Gothenburg the guitarist broke his hand so I asked Mattias Bärjed to join. We already had a covers band called Nymphet Noodlers and we played MC5, Alice Cooper, Stooges and 60's Psychedelic stuff. Mattias joined and something clicked, like a partner in music, so we started writing totally new songs for the gig in Gothenburg. We realised we needed a keyboard player and our sax player Simon Jedvik knew a guy and he brought Martin Hederos along to a rehearsal. He was at the same school as me and Mattias but he was studying music and those guys were not that cool, so, we were kind of sceptical in the beginning. Martin said something like ‘I never really played Rock ‘n’ Roll but I'll try my best’ and we started playing, it was quite loud and he went nuts, he played like hell and we were like ‘yeah, you got the job!’ I can tell you that he changed his wardrobe quite quick once he joined us!” Fellow Karlstad resident and childhood friend of guitarist Mattias Bärjed, the acclaimed comic book artist, movie director and musician David Liljemark recalls those early days. “Not counting their earlier related bands, I first saw Nymphet Noodlers when they were still a covers band. 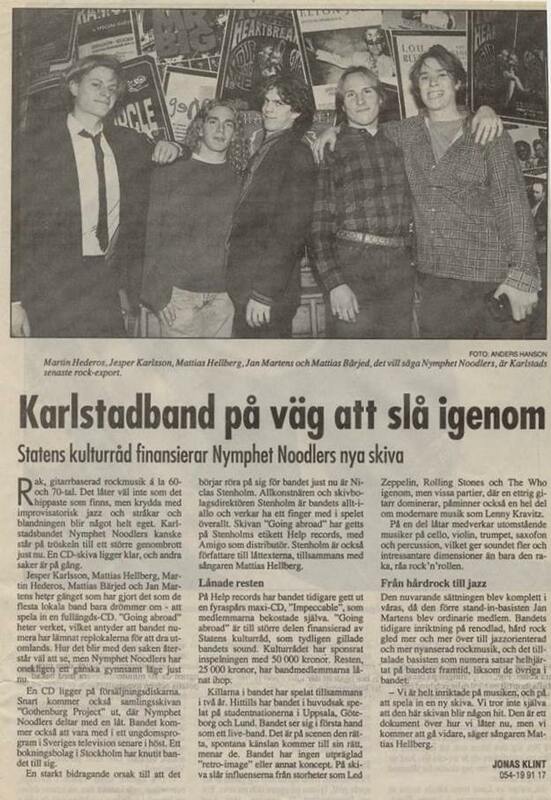 February 1992 at Café Creole, Karlstad, I remember that they played the Kinks' ‘Till the End of the Day’. 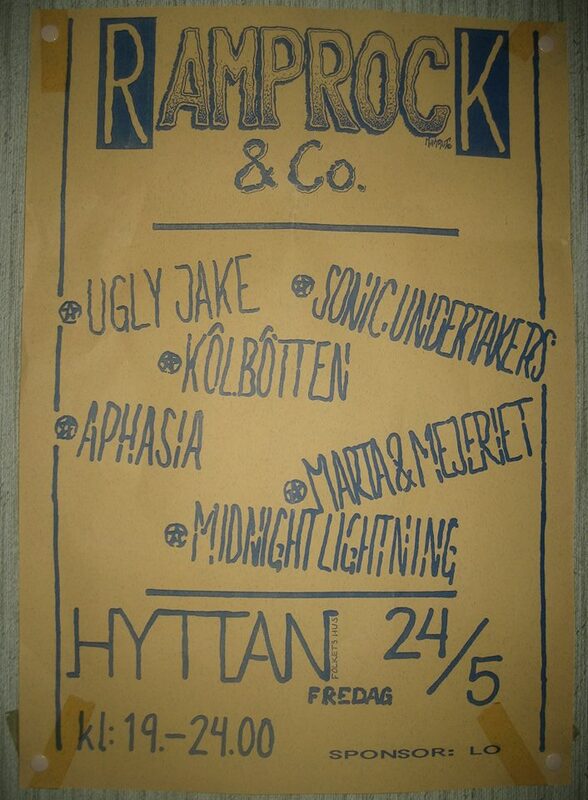 Then 10th October 1992 at Kyrkerud Folkhögskola in Årjäng but in my calendar it says ‘8pm Ugly Jake’ and we have at least a version of “Helter Skelter” on tape, featuring a vacuum cleaner I think! 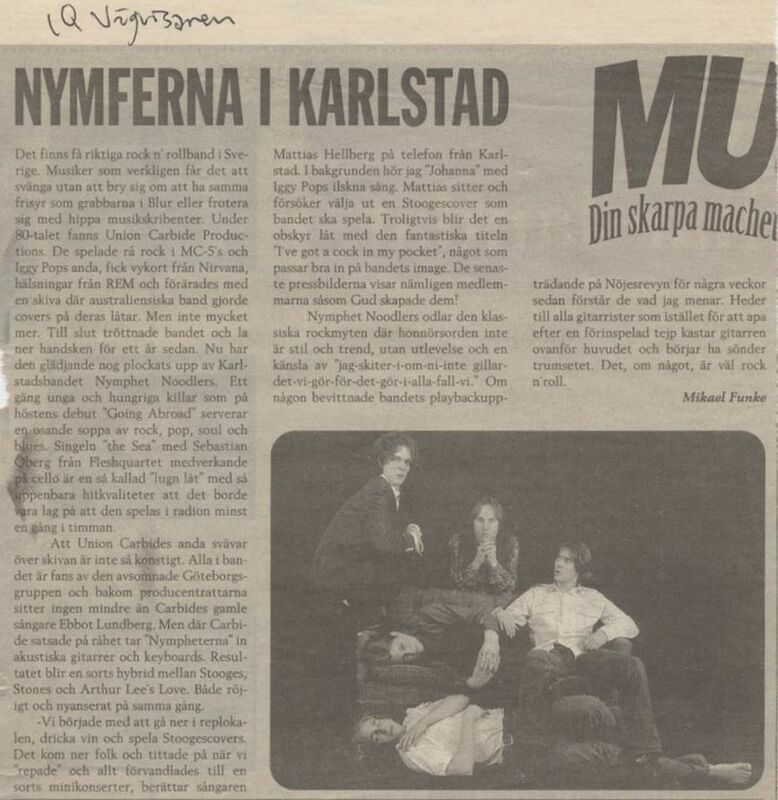 In January 1993, I saw them at a former cinema called Röda Kvarn (Red Mill) by Karlstad Town Square, very close to the recording of the ‘Impeccable Selection’ EP". 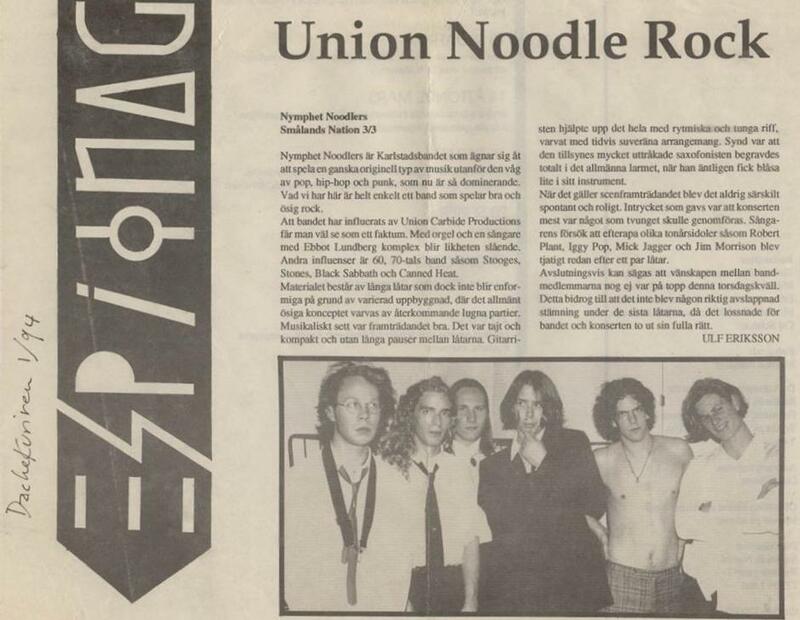 The Noodlers promoted a local gig for the legendary Gothenburg based Punk Rock band Union Carbide Productions, fronted by the charismatic and unpredictable Ebbot Lundberg. Both acts were heavily influenced by Iggy & The Stooges and Hellberg explains further. “We put on the infamous Union Carbide gig at the university (in Karlstad). When they started to play those 90 people or so who had paid for tickets just ran out of the venue. They fucked up the PA totally, Ebbot broke about five microphones, Björn Olsson fell asleep and got his guitar wired up in the lighting rig and it fell down, I think they played maybe 5 or 6 songs”. The Noodlers also gained a reputation for some pretty wild and chaotic behaviour as David Liljemark witnessed. “I remember Lund Student Union where Björn Olsson was a guest and saxophonist Simon Jedvik was wearing a lizard costume. Simon told me recently that at Värmlands Student Union in Lund, Mattias brought along a teddy bear suit and wore it during their soundcheck. Luckily he noticed that the stuffed belly made it hard to play guitar so he skipped it for the gig itself! That was probably just after the album was out (which I thought sounded weaker than their live assault). I think that was when I bought a cheap homebuilt guitar at a flea market; it didn’t work so I donated it to Mattias to smash on stage. Chrougen in Lund, possibly 30th November, which is King Karl XII’s day, an old King that neo-Nazis have taken a liking to for some weird reason and they take to the streets to demonstrate. People were scared to go out and it was almost like a ghost town outside, but I would not let that stop me from going to see Nymphet Noodlers". 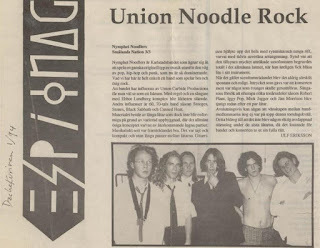 Not to be deterred by their first chaotic attempt at putting on a gig for Union Carbide, the Noodlers invited them back to Karlstad again as Hellberg explains. 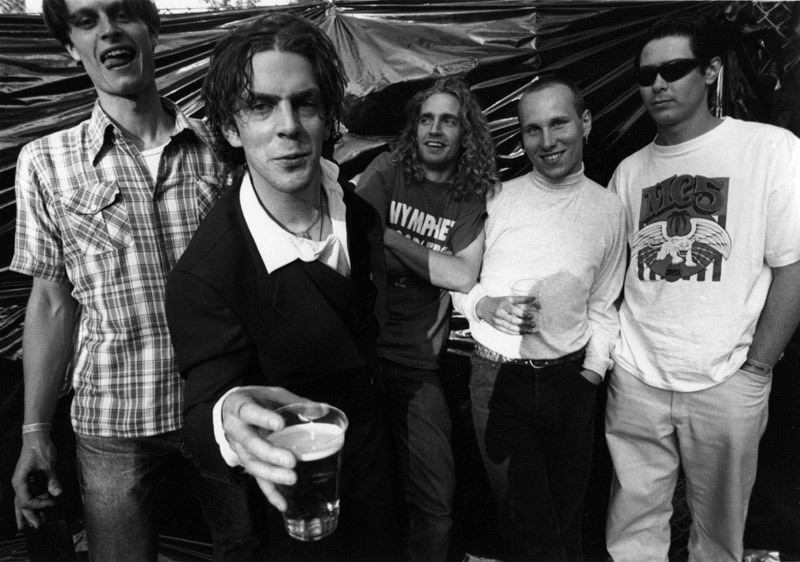 “We had arranged another Union Carbide gig in 1991, we had them back and this time the crowd stayed. I talked to Ebbot about producing us and he saw us play in Gothenburg, he was into it and in 1993 he produced ‘Impeccable Selection’ our four track demo EP”. A year later Ebbot went on to produce their debut LP “Going Abroad” and there’s no doubting that his influence looms large over these recordings, not least in his prominent backing vocals on tracks such as “Sane”. Ebbot was justifiably pleased with the “Going Abroad” album, which still sounds fresh and exciting to this day. Indeed once at a TSOOL after-show party, I was getting Martin to sign the album cover and as soon as he had finished, Ebbot grabbed it and signed it too, proudly announcing, “I produced this you know!” There's no doubting the Noodlers made a lasting impression on Ebbot, especially their talented keyboard player as Hellberg admits. “I remember Ebbot called me when they did the last Union Carbide Productions tour, ‘do you think we could use Martin as keyboard player for UCP?’ I said, ‘Don’t ask me, ask him’, so he did and Martin joined them and then he was under the wings of Ebbot”. One of their heroes also fell for the Noodlers. Wayne Kramer from the MC5 declared himself a big fan of the band. 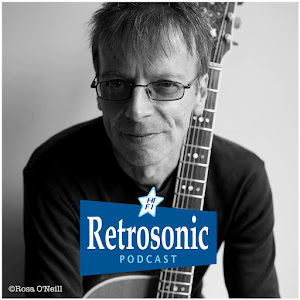 “I’d sent the LP to his record label” Hellberg told me, “and before a gig of his in Gothenburg there was an interview in the local newspaper and Wayne said ‘I’ve got to see Nymphet Noodlers, they blew me away’. So we went to the Club while he was sound checking and met him and he was like ‘hey, my brothers!’ and he was really nice to us. We got T-Shirts and signed CDs; he was so sweet to us. I played guitar with The Hellacopters on their first US tour in 1998, Wayne met us in LA, that was a feather in my cap among the Hellacopters guys, and he joined us on stage for two songs”. However, despite this high profile patronage and a superb album under their belts, Nymphet Noodlers unexpectedly fizzled out and I asked Hellberg why. “We recorded the LP and we toured Sweden, Norway and Denmark but never outside Scandinavia. We were totally out from the scene in Sweden at the time. 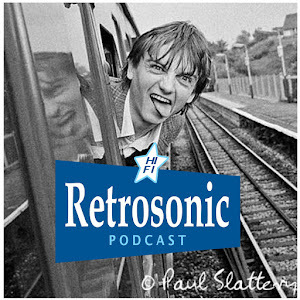 It was all Shoe-gazing, Blur and Oasis and we were doing Stooges, MC5, and even weirder arrangements that were too over the top for the usual Rock crowd. We kept touring for a while but the press and media didn't write anything about us and I must say that Mattias changed quite a bit for a while musically. He started to write other songs and he joined another band from Karlstad called Mindjive and things just fell apart for Nymphet Noodlers”. 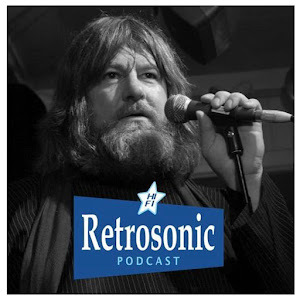 In the meantime, Union Carbide Productions had also split up and Ebbot was busy putting together his next band The Soundtrack of Our Lives along with former UCP guitarists Ian Person and Björn Olsson. They had been dabbling in various short-lived projects such as Black Balloons, Levity Ball, Charlie Don’t Surf and the KB Johnson Quartet and had the blueprint in place for their next adventure. As I mentioned earlier, Ebbot was certainly impressed with the Nymphet Noodlers and if you listen back to their “Going Abroad” album, in particular the tracks “Unlimited Sympathy” or “Father”, they could almost be a bridge between the later Union Carbide Production songs such as “Golden Age” and what would follow with The Soundtrack Our Lives. So, the three of them invited Martin Hederos along for the ride and his classical training and genius in orchestral arrangements allied to his bubbling 60’s style Hammond organ would go on to become vital components in TSOOL’s sound. 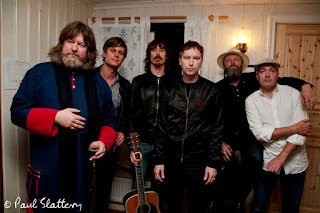 Ebbot completed the rhythm section by plundering two Gothenburg based bands, The Electric Eskimoes for Bassist Kalle Gustafsson Jerneholm and Whipped Cream for Drummer Fredrik Sandsten. Then in 1997 when Björn Olsson decided to leave the band to pursue a solo career, Ebbot went back to Karlstad to take Mattias Bärjed from Mindjive. So, what about the other members of Nymphet Noodlers? Singer Mattias Hellberg embarked on an eclectic, if somewhat restless, solo career releasing albums either under his own name or with some superb Psychedelic-Soul projects such as The Fur Heads and The White Moose. Perhaps his biggest success was when he got back together with his old Nymphet Noodlers friend and colleague Martin for the duo Hederos & Hellberg. Initially they recorded a demo album to help them get some low-key gigs in bars and clubs but it was snapped up and released by Gravitation Records in 2000 to great and unexpected acclaim. Their set, entirely made up of stripped back, baroque cover versions of classic tracks by bands and artists such as The Stooges, Rolling Stones, Dylan and The Velvet Underground became a huge hit. Acknowledged by Iggy Pop and invited on tour by Ryan Adams, this success would ultimately lead to their downfall as demand for shows started to clash with Martin’s busy Soundtrack of Our Lives schedule. Hellberg’s love of World Music also saw him working with Ugandan-Swedish Soul singer Jaqee and with the Dub Reggae Rock outfit Kanzeon and in 2005 he was asked to sing with legendary Swedish band Nationalteatern’s Rockorkester for a summer tour and has been a full time member ever since. 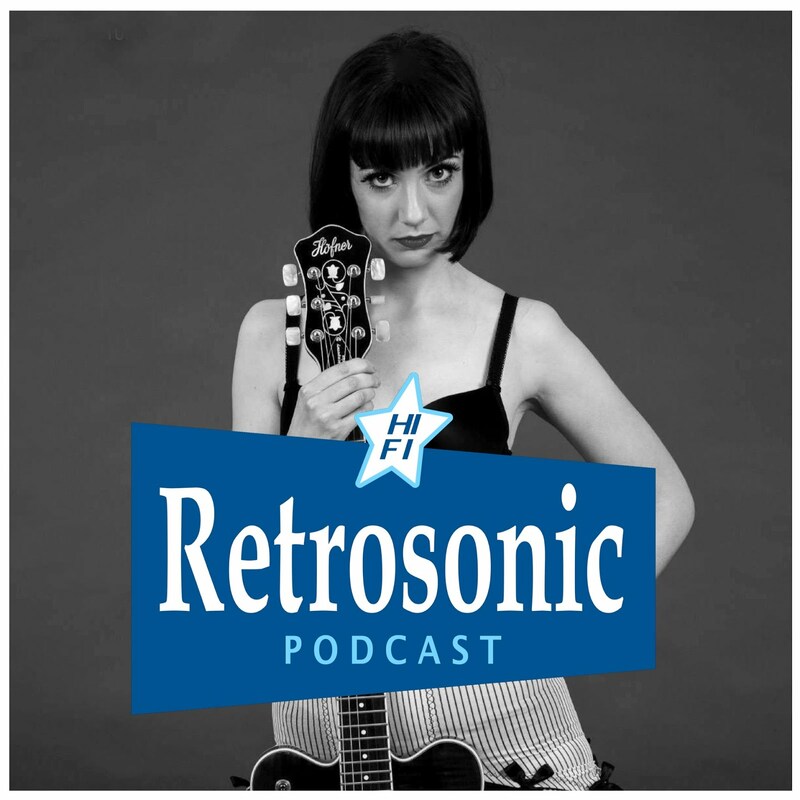 His talents as a guitarist also saw him in demand and he has toured and recorded with The Solution and The Hellacopters and even helped out The Soundtrack of Our Lives. Recently he has been playing sold out arenas as part of Swedish superstar Håkan Hellström’s backing band and touring with Norwegian band Janove. Bassist Jan Martens went on to form The Jan Martens Frustration and Rocket ’99 and he is now working on new material. Drummer Jesper Karlsson also helped Jan with The Frustration and has, until the sad and untimely death of Robert Dahlqvist early in 2017, been in Dundertåget and before that Thunder Express and Diamond Dogs. Mattias Bärjed did not stay still even when he was in The Soundtrack of Our Lives; his love of classic Heavy Rock saw him form Free Fall along with ex-Noodler Jan on bass, vocalist Kim Franson and the excellent drummer Ludwig Dahlberg from The International Noise Conspiracy. He also went on to become a well-respected movie and TV soundtrack composer and I would definitely recommend getting hold of the mind-blowing “Upp Till Kamp” soundtrack album. He has also been playing packed out stadiums in ex-Broder Daniel singer Henrik Berggren’s band and has toured with Swedish Punk legends The Refused. However, it is Martin Hederos who has been the busiest of all the ex-Nymphet Noodlers. He has become the go-to person for an impressive list of Artists desperate to utilise his expertise on the keyboards and violin and his skills with orchestral arrangements. He has worked with Anna Ternheim and Sofia Karlsson and last year finally released his first solo album of piano music. Some of the highlights we have seen him involved with over the past few years include a superb, intimate gig with Nina Persson from The Cardigans at the Ystad Theatre and a full on extravaganza with Ane Brun at the Forum in Kentish Town. Then there was a great show with Tonbruket at the Vortex Jazz Club in Dalston last February, which was something quite special. In fact, it is down to Martin that we find ourselves here in the charming University town of Uppsala on a crisp December evening looking forward to witnessing a rare Nymphet Noodlers reunion. 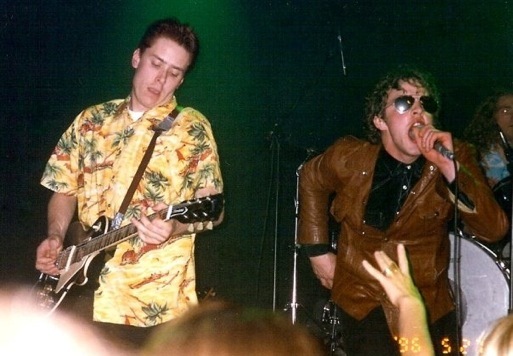 The band have played a couple of shows over the years since they split up but this was certainly their most high profile appearance of the lot. The gig was the culmination of a yearlong residency by Martin as guest curator at the Uppsala Konsert & Kongress, where he put on a series of musical and cultural events throughout 2017. We were warmly welcomed by the venue’s Director Esbjörn Mårtensson, a classical musician who went onto run Sweden’s big performing arts awards ceremony the Polar Prize before taking up his role at the UKK. He first got to know Martin when he invited The Soundtrack of Our Lives to perform a selection of Led Zeppelin songs in front of 2006 Polar prize-winners Robert Plant, John Paul Jones and Jimmy Page no less. Esbjörn also happens to be the dad of Hugo, the drummer in the excellent Stockholm based Psychedelic outfit Side Effects and also, in a nice piece of synchronicity, with none other than Ebbot Lundberg’s current backing band The Indigo Children. There was a pre-gig reception and speech where Martin was thanked for all his hard work over the year and we were treated to a nice bonus as Mattias Hellberg joined him on stage to recreate Hederos & Hellberg and play a moving version of the Stones “Shine A Light”. I bumped into Nymphet Noodlers original saxophonist Simon Jedvik and I asked him if he was going to be making an appearance. Simon was very self-effacing and laughed off the idea telling me that he originally left the band because he felt he was just not quite good enough to keep up with the Noodlers. That and an arm injury meant that he decided to call it a day. I think he was being modest as his sax playing on "Going Abroad" is damn good. Anyway, it was nice to chat to Simon and it meant that I managed to get another signature on my album cover! His place at the gig was to be taken by Mats Gustafsson, the well-respected freeform Jazz saxophonist who has played with Sonic Youth and Jim O’Rourke among many others. Mats joined Martin on stage to run through an instrumental number before we all moved upstairs for the main event. The venue itself is surprisingly good for a modern conference centre; it has a nice atmosphere with an excellent sound and light show throughout. The sense of anticipation builds as the band, Mattias Bärjed, Jan Martens, Martin Hederos and Jesper Karlsson appear and they start up the slow intro to “Sane”. As it builds to the powerful, crashing chords, Mattias Hellberg suddenly bursts on stage. He is the perfect front man, compelling and charismatic. Of course he has such a great voice too, soulful but still raw and powerful, he really is one of Sweden’s most underrated singers. He plays a mean harmonica too! I have only really seen Hellberg play quite laid-back shows either as a duo with Hederos & Hellberg or playing guitar and singing with The Fur Heads, so it is great to finally get to see him in what appears to be his natural habitat. He has the lithe moves of Mick Jagger and Iggy Pop and looks totally at ease up front leaning out over the crowd, encouraging more reaction. The band sound amazing, so powerful and contemporary that you forget their hey-day was actually back in the early to mid-90’s. Mattias Bärjed’s guitar spits out some wicked fast paced riffs especially on a couple of old unrecorded songs, first of all “Fake Moustache” which wouldn’t be out of place on Free Fall’s album and then “Ron Asheton” which certainly sounds like a fitting tribute to Mattias’ Stooges guitar hero. The band temper their aural assault with the Bluesy swagger of the Rolling Stones and Led Zeppelin kind and the rhythm section of Jan Martens, with his thunderous John Entwistle style bass lines, and Jesper Karlsson’s tight and solid playing means they also have a serious groove. They play a good chunk of the “Going Abroad” album including the title track, a bizarre comedy instrumental interlude with Mats Gustafsson’s Sax adding a great avant-garde touch. Martin is his usual blur of energy behind his keyboards and it’s exhausting just watching him play. A snaking “Divine Curse” and the powerful “Unlimited Sympathy” are just two of my highlights of a great set and they end with the immense “Small Town”. The band come back for an encore of “Beautiful Day” and one of their earliest numbers “Rights”. They are called back for more and reprise the night’s opening track “Sane” this time with Mats' mind-blowing Sax that elevates the song to a different level and it’s over all too quickly. 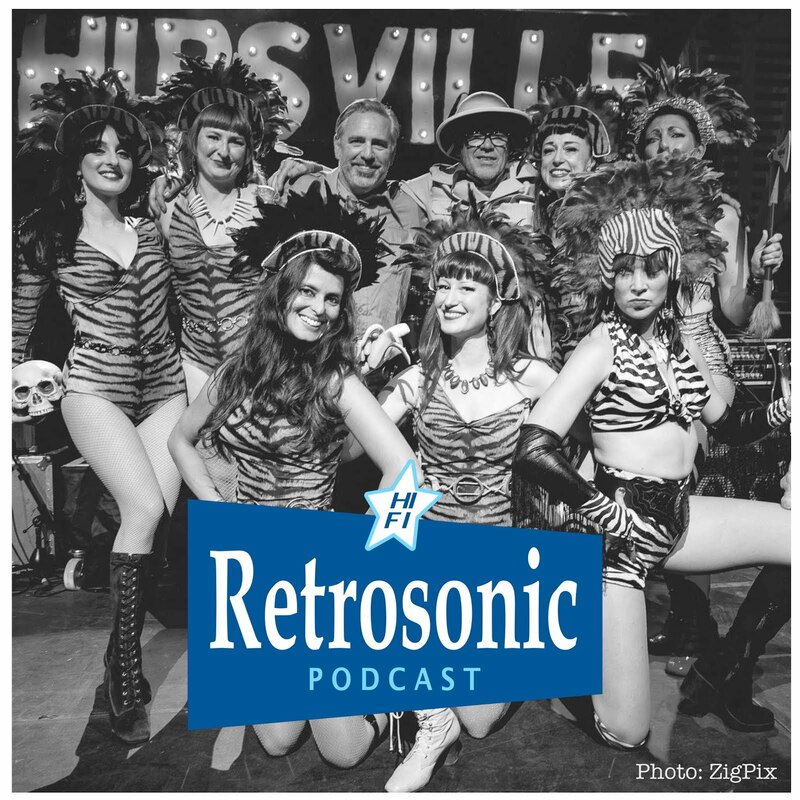 After the show, I asked David Liljemark what he thought about the reunion, his first Nymphet Noodlers show for about 22 years and how it compared to those early days. “It was amazing! One of the best gigs I've been to! They were better than ever, which is saying a lot. Hellberg walking out among the crowd and so on was good to see, standing on the drums, posing with the tambourine and being back to his old rock star front man antics. Back where he belongs! 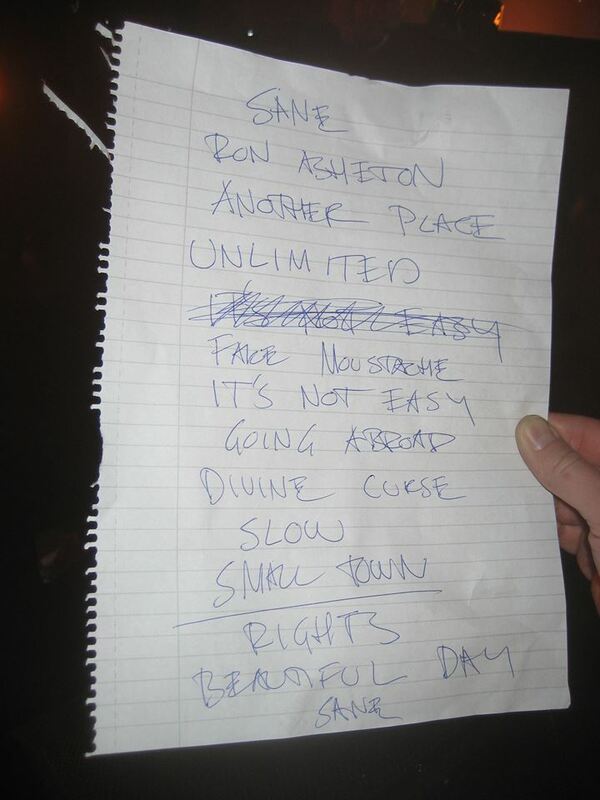 The absolute highlight in a set full of them, was 'Rights' - absolutely devastating - and 'Small Town', of course. The atonal part of 'Divine Curse' got a good boost by Mats G too! 'Slow'...so many classics. Hope they'll play again soon, but I won't hold my breath. Now, let's hope this UKK gig and all sorts of archive stuff gets released in some way!" I agree and sincerely hope that the overwhelmingly positive reaction and the fact that the band seemed to be enjoying themselves as much as we were in the crowd, might tempt them to get Nymphet Noodlers back on a more permanent basis. They may finally get the credit that is long overdue. 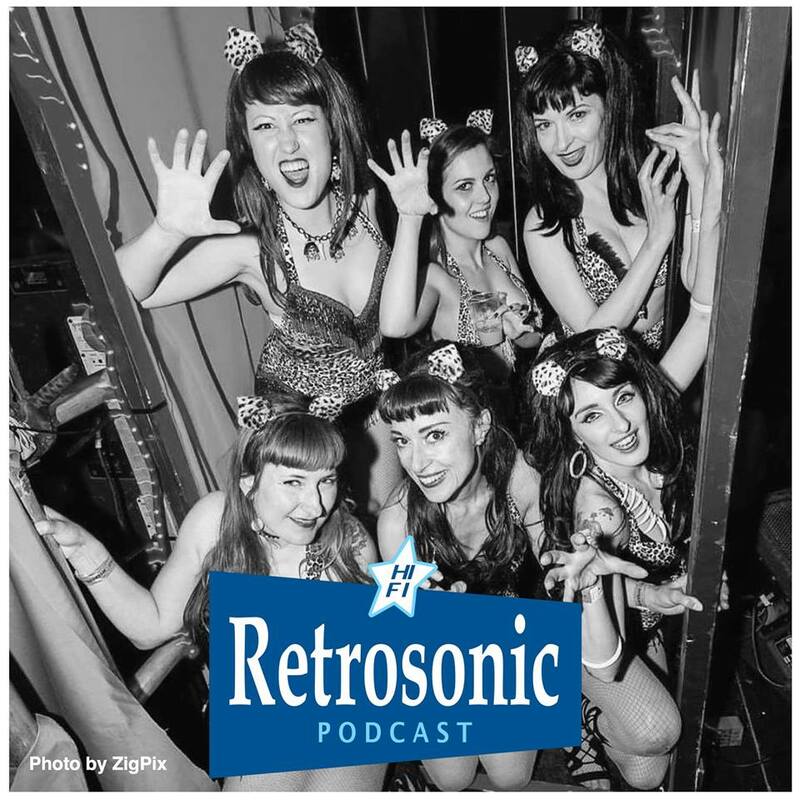 You can see more photos from the reunion show over at the Retro Man Blog Facebook page here. There are also some videos up at our YouTube channel here.